PM Modi Varanasi Yojana List | Pradhan Mantri Narendra Modi Varanasi Scheme Name | CM Yogi Varanasi Yojana All Yojana | PM Modi Gift to Varanasi Yojana Latest News. PM Modi Varanasi Yojana List:- Pradhan Mantri Narendra Modi Latest Scheme will be inugrated in Varanasi on 12 November 2018. Total PM Modi will launched minimum 10 scheme in Varanasi and many cabinet minister of Uttar Pradesh, Central Govt Minister are to be present in Varansi and they also attend to make paper of 2413 crore (24 Arab). In this good eve PM Modi Helicopter land in Ram Nagar Multi Model Terminal. After In Augrating Multi Model Terminal PM Modi take off from Babatpur Air Port. So you may check PM Modi Varanasi Scheme List 2018. A. 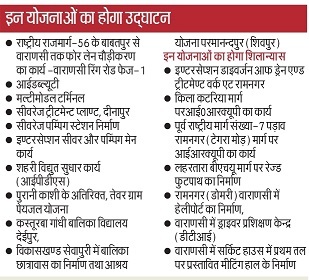 4 Lain Expansion from National Higway 56 Babatpur to Varanasi. Varanasi Rign road 1. C. Seavarage Treatment Plant, Dinapur. D. Seavarge Pumping Station in Varanasi. G. Old Kashi, Tevar Gram Peyjal (Water Treatment) Pariyojana. I. Hostel in Vikaskhand Sevapuri, Ashray Yojana Sanandpur (Shivpur). 2. Work on RIQP in Old National Highway Authority-7 (Ram Nagar Togra Mod).